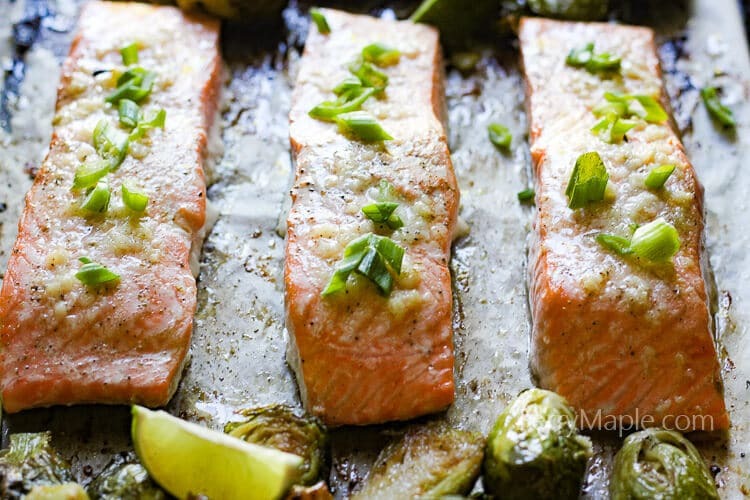 Garlicky buttery one pan salmon fillets with aromatic brussels sprouts ! Delicious, fast and healthy dinner. Everybody loves one pan dishes. They are family friendly, time saving and less dishes to wash, too! We usually buy wild Alaskan salmon from Costco, its full of omega 3 fatty acids and very tasty too. Takes as little as 15 minutes to fully cook and doesn’t really need any preparation. 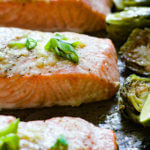 One pan buttery garlic salmon with brussels sprouts is a great dinner dish for families and for busy moms, like myself! Easy and healthy. Preheat oven to 450F. Line baking sheet with parchment paper and set aside. While brussels sprouts are cooking, prepare the salmon- wash the fillet, pat dry and cut in 3 pieces. sprinkle with salt and pepper. 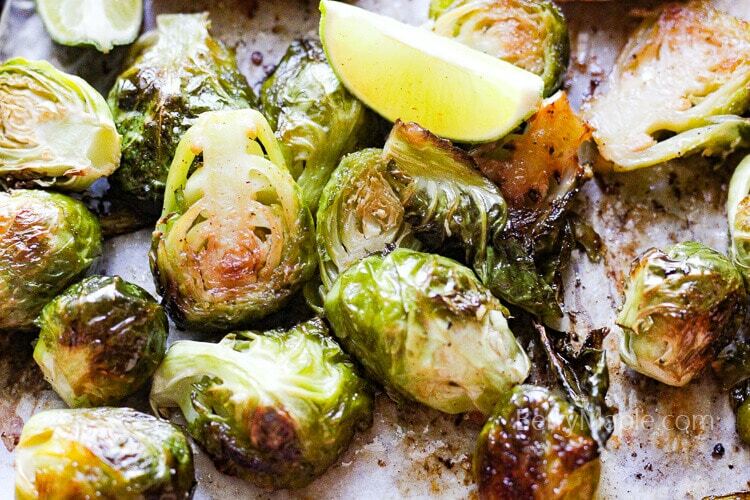 Take the brussels sprouts out of the oven. Make a space on a baking sheet for your 3 salmon pieces. Place salmon there. Those salmon fillets look gorgeous!! I always need meals that can be prepped right away for lunch. This is great! I love how quickly salmon meals come together – it seems so special for something that is SO quick. I like the alaskan/BC wild salmon the best, I think it’s so much more flavourful than the Atlantic! This is totally my kind of meal! 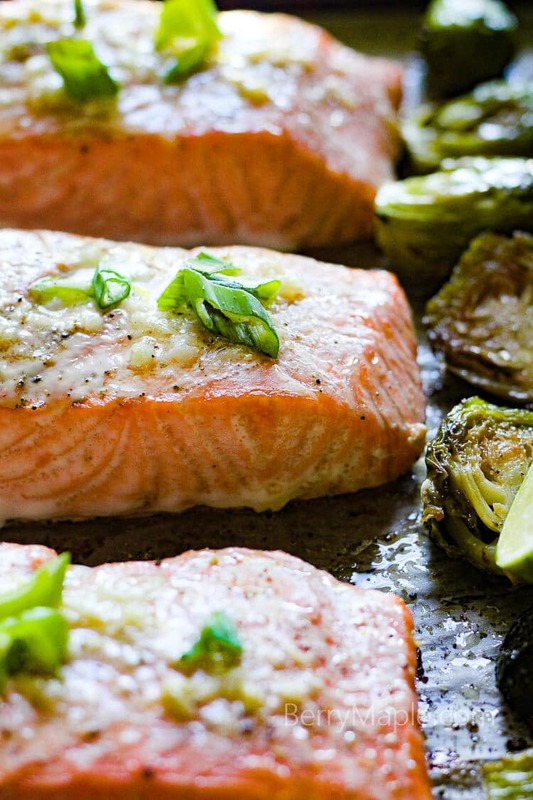 I LOVE one pan meals + salmon and Brussels sprouts both happen to be favorites in my home. My family would love this for dinner (or lunch OR breakfast). SO yummy! I love one pan dishes! This looks amazing! I love everything about this recipe! 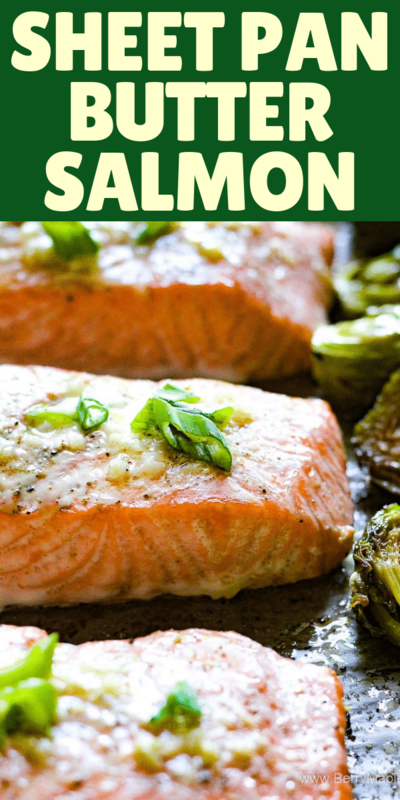 That salmon looks amazing and I am a HUGE sprout lover! thanks for sharing! I love the quick convenience of salmon recipes, and one-pan recipes are my new favourite thing! I know, I’m late to the game! So, this dish is a win-win for me! sheet pan meals = love!! Roasted brussel sprouts are the best! I love me a one pan dish and this looks fantastic! And those brussels sprouts? So perfectly crisped up, I can eat a pound of those in one sitting. Salmon is such an exciting food! Love how simple this is! This is just how we eat, such lovely simple whole foods. Thank you for another wonderful recipe. You had me a buttery, salmon, oh and brussel sprouts! I’ve never tried a good brussel with salmon before, this sounds amazing! Yuummm… Butter and garlic make everything amazing! Haha. Fabulous one pan meal! Love it! I’m all for less pans to wash. I do so much cooking and baking in my house that I find myself running the dishwasher 2-3 times daily. Crazy isn’t it? This salmon looks incredible and since my hubby has been on a big salmon kick lately. . .I know he would be thrilled to see these beauties show up on the table. I know the pain, i have two toddlers who are constantly making a mess…everywhere lol. Thanks for your comment! Salivating! Salmon is one of my favorite foods! I also love garlic. Great combo of flavors! I have to try this! thank you! try it, its yummy! I love anything that has garlic and butter. I’m not a fan of salmon but I bet this would be amazing on a white fish too! I m a big fan of brussel sprouts! Plus next to salmon it s just fantastic! As a kid i would have to sneak and get an invite to dine at my friends places if I wanted some brussel sprouts which my mom hated! I would get my invite and eat the leftovers of everyone at the table!! A real brussel sprout monster i was… love that little bitter back taste to them! Yum! Thank you! I love brussels sprouts too! We love salmon, and buy it from Costco too. Such an easy meal for any night of the week. Now that grilling season is here….love cooking it outdoors. Yeah, Costco salmon is always a great idea!